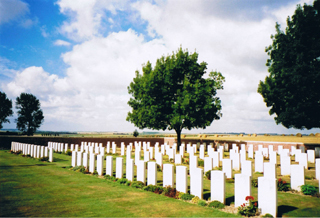 Englebelmer Communal Cemetery Extension, Somme. 4 miles N of Albert. S of village. Used from October 1916 during the Battle of the Ancre November 1916, the German advance of March 1918 and the second Battle of the Somme August 1918. 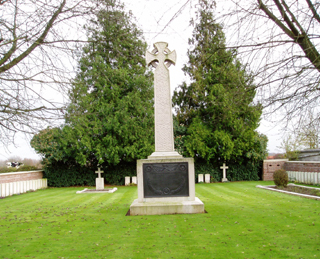 Records 120 UK., 28 NZ burials and 2 special memorials. 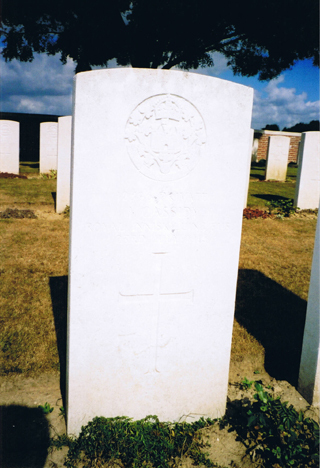 Grave in Englebelmer Communal Cemetery Extension of Private James Cassidy 1/RInniskilling Fusiliers. Executed 23 July 1916 for desertion. Private Cassidy had landed at Gallipoli on 25 May 1915. On 1 July 1916 his Battalion was in 87th Brigade attacking the German line in front of Beaumont-Hamel and on the right attacking south of Y Ravine. The losses were desolating. The 1st Battalion lost the CO Lt.Col. Robert Campbell Pierce and 3 other officers killed, 11 officers wounded and 4 officers missing. Of other ranks 50 were killed, 225 missing and 265 wounded. A total of 549, more than half the strength of the Battalion. Cassidy was a survivor but was shot 3 weeks later. Graves in Englebelmer Communal Cemetery Somme N of the Extension and 2 miles behind the front line on 1 July 1916 at beginning of the Somme offensive. 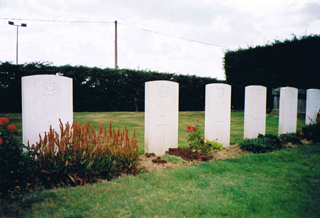 These are the graves of Private Harold Travis, Private W J Wilkins, Lieutenant Lewis Thierry Seymour, Private G Bareham and Lance Corporal W Read killed in action 13 August 1916 whilst serving with 2nd Battalion York and Lancaster Regiment in front line trenches north of Hamel. 10 miles SE of Le Cateau, north of the village, east of the road to Landrecies. All burials from the Royal Munster Fusiliers who fell in the Retreat from Mons on August 27th 1914 and were buried by prisoners of the battalion under German supervision. 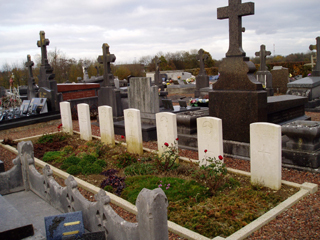 Records 122 UK burials, being in 3 plots with headstones (in alphabetical order) around the walls with the Celtic cross in the centre of the graveyard. 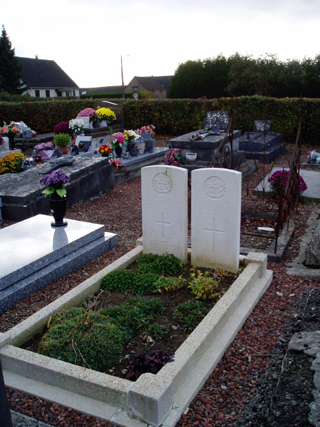 The Communal Cemetery at Etreux with a total of ten Commonwealth burials one of which is unknown, here with the graves of six identified casualties and the one unknown. Etreux is a village and commune in the Department of the Aisne 32 kilometres NE of St. Quentin and 20 Kilometres W of La Capelle, the communal cemetery being 2 kilometres N of the village. From the left, Graves of Gunner 70737 Gunner Francis Albert Victor Shewring Royal Horse and Royal Field Artillery, 118th Battery 26th Brigade, died of wounds 29th August 1914 received in the action at Etreux (see Entry for Etreux Military Cemetery); Driver 62810 James Mortimer Royal and Field Artillery, 118th Battery 26th Brigade, died of wounds 11th September 1914 aged 22 years received in the action at Etreux (see above); Private 8138 James Stanley 2nd Battalion Royal Munster Fusiliers died of wounds 31st August 1914 received in the action at Etreux; Private 7572 William Holland 2nd Battalion Royal Munster Fusiliers died of wounds 1st September 1914 received in the action at Etreux; Private 7775 Jonathan Howarth 2nd Battalion Royal Munster Fusiliers died of wounds 10th September 1914 received in the action at Etreux; Private 7470 John Halloran 2nd Royal Munster Fusiliers killed in action 27th August 1914; a soldier known unto God. Graves in Etreux Communal Cemetery of Captain Guy Maxwell Shipway Gloucestershire Regiment killed in action 23rd August 1914 aged 37 years. Headstone bears inscription “In Memory of the loved son of Lt. Col. and Mrs Shipway Chiswick England.” Son of Lt. Col Robert William Shipway of Grove House Chiswick London husband of Gladys Blanche Katherine Shipway: and No 7857 Private Ernest Smitheram 1st Battalion Gloucestershire Regiment died of wounds 26th August 1914. Grave in Etreux Communal Cemetery of No 9968 Private George Lay 1st Battalion Princess Charlotte of Wales’s (Royal Berkshire Regiment) killed in action 28th April 1915 aged 22 years. 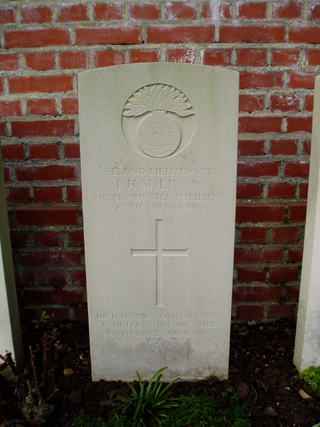 Headstone bears inscription “May his soul rest in the Lord.” The Battalion landed at Rouen on the 13th August 1914 as part of the 6th Brigade 2nd Division 1st Corps. On the 23rd August the Battalion was ordered to entrench in a position about 5 miles SE of Mons but took no direct part in the battle itself being in the area of Vellereille-le-Sec On the 24th the BEF began the Retreat retiring in conformity with the French Army. Whilst losses in the 2nd Corps. had been high, 1st Corps. had lost very few men but losses in action were not the biggest problem confronting the BEF on its southward march. The difficulty stemmed from the fact that the men were exhausted, the weather was very hot, the cobbled roads of France did not help with many soldiers suffering from sore and blistered feet. Long marches,a shortage of food and water and very little sleep were taking their inevitable toll. The Battalion was acting as rearguard of the 6th Infantry Brigade and by the 25th August had reached Maroilles 3 miles east of Landrecies. That afternoon B Squadron of the 15th Hussars had clashed with the German 48th Infantry Regiment at the bridge over the Sambre 2 miles NW of Maroilles, a Company of the Berkshire was ordered to return to the bridge to relieve the Hussars but found the enemy had possession of the bridge and there was an attempt to capture the bridge which failed, being at night and by tired wet and hungry men. 3 officers were killed or wounded, 2 other ranks were killed and 35 wounded and 22 were missing. The 6th Brigade billeted in the Maroilles area tht night and at 3.30 a.m.on the morning of the 26th August the 2nd Division and the Battalion was continuing its retirement south-wards towards Etreux which was the destination of the 6th Infantry Brigade but orders were received to push on to Venerolles to the south of that town. By the early morning of the 27th August the Division held the line Barzy-Boue-Etreux-Venerolles with the 6th Brigade and the 1st Battalion Berkshire Regiment at Venerolles just to the South of Etreux itself. 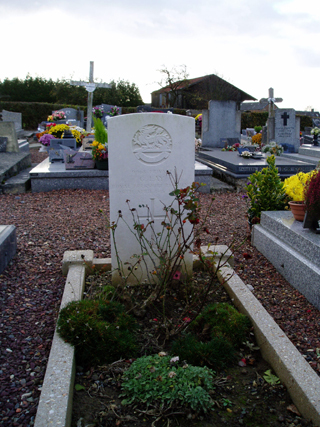 Private Lay became separated from his platoon and the Battalion and was concealed for some months by townspeople in Etreux until discovered and shot by the enemy on the 28th April 1915. Web Design Websynergi.com Sources Copyright ©2008 World War I War Graves. All Rights Reserved.